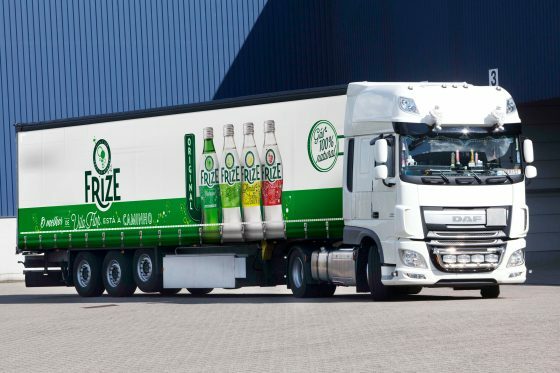 With a fleet of over 50 trailers, FLO Palettes – Groupement FLO chooses Solidskin curtainsiders. For over many years these trucks are a well known sight in France. Over 4000 new sets of Solidskin curtainsiders hit the road every year. Transporters around the world benefit from the high quality of Solidskin side curtain. They know from experience that these curtains are the best choice in the market for their durability, resistance to tear and wear and appearance. Since the introduction of the new corporate identities of Zandbergen and Ambrosius in 2015, about two hundred trucks have been equipped with Solidskin side curtains. A conscious choice: besides Solidskin curtainsiders, other brands trailer curtains have been on the road to test their quality and sustainability.According to Erik Zandbergen, director and fleetmanager, Solidskin offers an unrivalled quality. Van Houweling Transport recognizes the importance of the appearance of their car park as a tool for their reputation management. With Solidskin they can easily maintain their high quality appearance for years to come. Some pictures from our partner TOLDOS URCA, S.L (Spain) for Estrella Galicia on this Kögel Trailer GmbH. The design is printed on our Solidskin curtainsider substrate. Solidskin is the choice of the strongest brands across Europe. The high quality print and deep blacks and varnishing effect really make the design stand out and it will for years to come. We are super happy with the production of this curtainsider by Van Horssen Zeilmakerij for Prewelcon and Van de Sandt Construction BV. A very bright a colorful design. A perfect match for our high-quality appearance, our ability to match any colour and the long-term preservation of appearance when in use. Grupo Logístico Arnedo is the leading national transportation company in Spain. With their Solidskin curtain siders fitted by Toldos Urca, their fleet of 240 trucks is well protected against the harsh Spanish sun and heavy roads. The dirt-repellent characteristics also mean that the company can reduce the cleaning program of the curtainsiders. In 2010 Smurfit Kappa started driving with Solidskin side curtains. Seven years later more than 200 of these curtains are (still) driving and look great with their high-gloss finish and deep black appearance. Smurfit Kappa embraces the sturdy quality and cost reducing low maintenance of a Solidskin truck curtain. We love our neighbours 🙂 Van Reenen in Barneveld is using our Solidskin curtainsiders. Over a hundred trucks have been equipped with our curtains for around 7 years now: a solid proof of quality. UV, rain, cold and mechanical stress haven’t influenced the colours. They still exactly match the truck's body paint colours. The subtle yellow hasn't faded and the curtains are clean and look fresh. And we guarantee that they will remain to do so for years to come! It is an impressive sight to see them roll. ‘Stilleven met bloemen in een glazen vaas’ (Still life with flowers) by Jan Davidsz. de Heem, The Nightwatch of Rembrandt or 'Children of the sea' by Jozef Israëls. Since last year we have been releasing side curtains with famous masterpieces of the Dutch Rijksmuseum in The Netherlands. We do this not only because we love to share these paintings, but also because we share a similar philosophy. Our production techniques and conservation of image for side curtains are set to the highest standards just like the Rijksmuseum and these famous painters. That is why we labelled these trucks 'meesters in beeld' (masters of image). That is what we've been doing at Printable for more than two decades: achieving the highest standard. After more than 8 years, SkyClean ordered new sets of side curtains. It was not really necessary but because of the fact that they changed their corporate identity and had an expansion of their fleet, SkyClean required the same proven quality which they are familiar with for so many years. As you can see, the white shows no dirt and is still clear in comparison to other side curtains that would not even make it through one year without visible and permanent wear and tear. Solidskin offers an unrivalled quality and this reference proves once again that we practice what we preach. Producers of full-colour curtainsides for curtainsider or tautliner trucks regularly say that using UV ink is better for the environment, repeating without question the claims of their ink suppliers who play up the odourless nature of the ink. By doing so, they are manipulating the market with this deceptive (and illegal) information. The small print in the ink safety instructions states “Causes skin and eye damage[CL1] . May damage fertility or the unborn child”. As if the impact on humans doesn’t matter. In 2010 the Fetim Group started driving with 70 sets of Solidskin side curtains. Seven years later these curtains are still driving and look great with their high-gloss finish and deep black appearance. Fetim embraces the sturdy quality and cost reducing low maintenance of a Solidskin truck curtain. A full-colour curtain side is a perfect way to profile a product or service to the public. In order to create a convincing message and utilise the opportunities to their fullest, there are a few things to take into consideration when coming up with the design. Here are 8 points to consider when designing curtain sides for lorries.